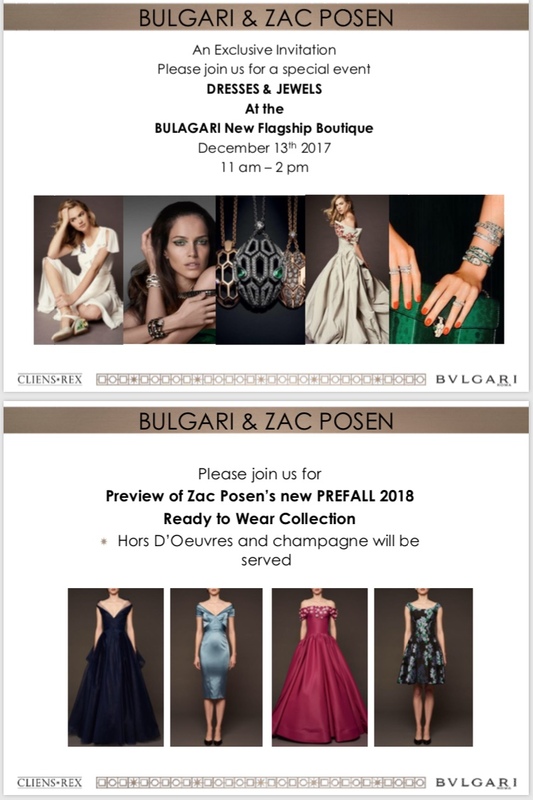 On December 13th we are hosting en Exclusive Event - Zac Posen will introduce samples from his new PreFall Collection paired with magnificent Bulgari Jewels and Accesories for Spring Summer 2018. This upcoming Wednesday, together with Andrea Granalli, BULGARI High End Watch director from Rome, Elina Bromberg will be hosting an exclusive evening for watch lovers, connoisseurs and collectors. You will learn all about Grand Complications, Minute Repeaters, Tourbillion movements, chiming watches, including our World record holders, Octo Finissimo watches. After Andrea's talk you can examine the watches, try on and ask questions, as well as mingling, networking with fellow watch enthusiasts and collectors. The event begins at 6pm at Bulgari's new luxurious boutique located at 730 Fifth Ave, at the corner of 57th Street. Single Malt Scotch will be served. A masterpiece of design, the boutique was redesigned by famous architect Peter Marino and features marble and mosaics, vintage chandeliers, midcentury furnishings and beautiful jewels and watches from Italy. And of course, tantalizing and inspiring stories and history behind every piece. To learn more about BULGARI watch expertise visit the BLOG. SerpentiForm changes skin with each edition: the next phase is Singapore, from August to late fall. 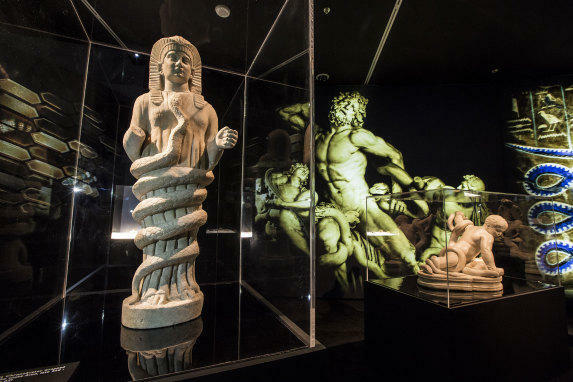 An exhibition providing an in-depth and wide-ranging view of the imagery related to a universal symbol of rebirth, seduction, power, and transformation. Modern and contemporary artists have been deeply inspired by its graphic potential and evocative symbolism, and many of their works are exhibited in the pathway of SerpentiForm, such as Marc Chagall, Keith Haring, Joan Miro, Niki de Saint Phalle, Giacomo Balla and Alexander Calder. From ancient to modern, the enduring strength of this symbol emerges in all its powerful timelessness, snaking out among jewels, works of art, design objects, memorable shots by masters of photography, and magnificent theatrical and cinematic costumes. Bulgari hosted an event in the city of Venice, in which the debut of the Maison's High Jewelry Collection, "Festa", was unveiled. Scuola Grande della Misericordia was the scene, as guests of celebrity stature, including Bella Hadid, Lily Aldridge, and Shu Qi attended. An orchestra reinterpreted Italian themes, a runway followed by a gala dinner, special performances sequenced to a night of dancing - a "Festa" was manifested. The Maison celebrated the essence of the Italian way of life for an evening in Venice, for eternity through the collection.